Math games! Wait, don’t leave! Come back!! Mathster is a game app where you tap buttons to fill in the blank or blanks of a simple math problem. There are some powerups, false numbers, and pairs thrown in to make you work your brain and develop your basic math skills. 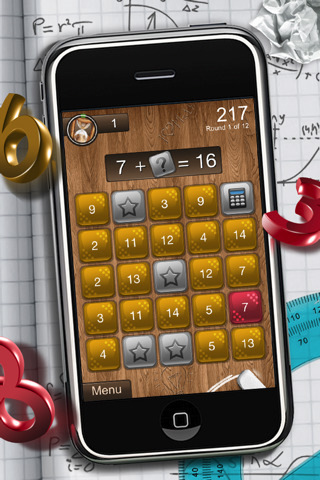 Brought to us by Matt Davenport, you too can improve your math skills for $1.99 on the iPhone or iPod touch and brag about it via Openfeint! IPad support coming soon. Alrighty, let’s start with gameplay. You have an equation and you have to tap number buttons to fill in the blanks correctly. Simple equations like ? + ? = 14 and you’ll have a range of numbers like 11s and 3s, 5s and 9s, and other such combinations. The trick is that once you see a single pair, say 11 and 3, anytime you see 11 on the keyboard, there will always be 3 in the same keyboard. Hit all the same pairs and you’ll move on to the next number set, or if your time runs out, you’ll automatically move on. On harder difficulties, the time you have is very short, the numbers get more complex, and the challenge gets pretty intense later. The sound effects are alright and the graphics are basic but crisp. High quality wood texture along with bright, easy to read buttons. It’s all good from that department. Mathster is a pretty good game for improving your quick math skills and it definitely improves your basic addition and subtraction skills. In the next update according to Matt Davenport in the AppStore description, an update will be coming soon which includes multiplication, division, iPad support, multiplayer mode, and even more powerups and achievements! Woot! Way to start off this app. I had fun with it, surprisingly, and I think you will too. Try it’s free version to see if you’ll like this one too! 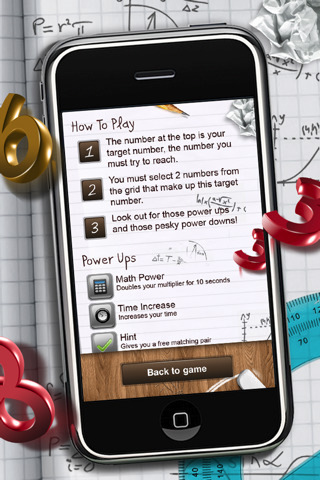 AppSafari review of Mathster was written by Joseph Ho on November 2nd, 2010 and categorized under App Store, Games, Time Management, Word Games. Page viewed 3218 times, 1 so far today. Need help on using these apps? Please read the Help Page.